Tala, Paphos – This spacious one bedroom apartment is situated on a well maintained project within walking distance to the popular Tala Square and local amenities of the village. The main town of Paphos and the coast are a 10 minute drive away. The property features an open plan living area with corner kitchen, large double bedroom with fitted wardrobes and a family size bathroom. The kitchen is well equipped with ample cupboard and worktop space. Appliances include built-in oven, electric hob and extractor fan, fridge/freezer, washing machine and microwave. Sliding patio windows in both the living room and bedroom provide easy access to a wide balcony with stone balustrade – ideal for outdoor dining and enjoying both the stunning sea views and magnificent sunsets. The communal gardens are beautifully landscaped and include a variety of trees and shrubs. 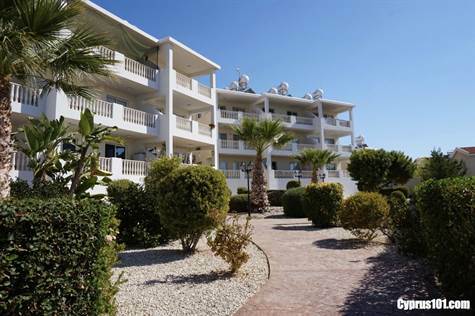 There is lots of space for sunbathing around the fabulous swimming pool and there are shower, toilet and changing room facilities located to the side. The property is ideal as a holiday home and/or rental investment. It comes fully furnished and has title deeds.